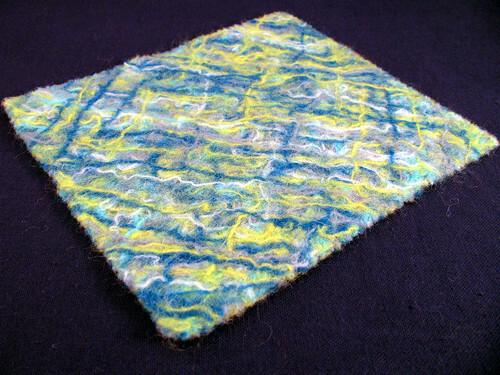 I think this felting technique is called weaver’s felt. It is just an easy way to make felt. It works best using roving, or un-spun wool fibers. I didn’t have any so I just used some ends of different color wool yarn clippings which I untwisted. This was just a test. I wanted to see if it really worked after reading about it. All that is needed is the wool roving, a couple of towels as big as the piece you want to felt, and a bottle or two of clear dish soap. Then on top of one towel place one thin layer of fibers on the bias, followed by another layer on a cross bias, then a final layer like the first one. More layers make the felt thicker, but these three layers form the essential base. Novelty threads can be placed on top to make an artsy felt if desired. The next step is to saturate every fiber with dish soap. If any spot is missed there will be a weak place in the finished felt. Next place the second towel on top. Smooth everything out and roll it tightly like rolling up a carpet. Tie the roll tightly every few inches. Set the washing machine on hot and wash it. I used the longest agitation time setting on my washer. After washing throw it in the dryer or just unroll it, if impatient like I was, and see if it felted. The towel peeled right off and left this piece of felt. I saw a beautiful coat made with felt using this technique. My sample looks like dryer lint because of the colors I chose to try. I will think of this a warm weather project. Applying the soap is messy and I will do it outside next time. On the other hand my kitchen counter is really clean. 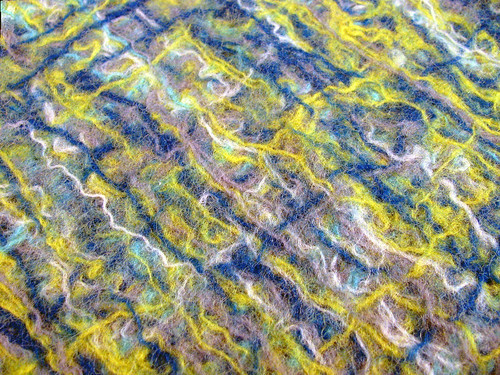 Close up photo of the fibers felting. This entry was posted on Friday, February 6th, 2009 at 3:00 am and is filed under Craft and Yarn. Tagged: Craft, Felt, Yarn. You can feed this entry. You can leave a response, or trackback from your own site.